Cake is a terrific do-ahead dessert and my first choice when I’m cooking for family and friends so I’m always looking for new ideas. Recipes published in New Zealand’s food magazine “Dish” that are are devised by Claire Aldous are a constant source of inspiration. She has with flair for interesting ingredient combinations, textural interest and gluten free ingredients. In the lead up the Mother’s Day I came across this recipe for Raspberry and Rhubarb White Chocolate Cake. The idea of using both raspberries and rhubarb was immediately appealing but the inclusion of white chocolate made me hesitate. It’s not a flavour I especially enjoy. I decided to omit the chocolate then realized as I was making the cake it was meant as a punch of sweetness with the tart fruits. Thankfully the supermarket is close by. I made the recipe verbatim. It’s a simple melt and mix method batter which in layered with uncooked fruit and white chocolate chunks and then topped with flaked almonds. Presented on a dramatic plate with a dusting of icing sugar the cake looked very tempting. I cut it while still warm and served it with slightly sweetened Greek yoghurt. This cake was meant to be dessert. It was deliciously moist and fruity, not overly sweet and I was pleased that the white chocolate had faded into the background. Grease a 26cm springform pan and line the base and sides with baking paper. Prepare the rhubarb and white chocolate and set aside. Measure out the almonds and raspberries. Into a large bowl, weigh and measure all the dry ingredients for the cake batter. Gently melt the butter, then whisk in the eggs, maple syrup, vanilla essence and orange zest. Stir the wet ingredients into the dry with a wooden spoon, beating vigorously to remove any lumps. Spoon half the cake batter into the prepared tin. Scatter over the frozen raspberries and half of the chocolate chunks. Carefully spoon the remaining batter into the tin, then scatter over the prepared rhubarb and the remaining white chocolate. Scatter the flaked almonds over the top and gently press down. Bake the cake in the centre of the oven for 50-60 minutes or until the centre is cooked when tested with a skewer. Remove to a cake wire. Allow to rest for 10 minutes before releasing and removing the sides of the cake tin. Serve warm with whipped cream or yoghurt. Best eaten the day it’s baked as the fruit will soften the cake significantly. sounds lovely Sandra, and I have all the ingredients bar the raspberries – do you think it would be too much with just rhubarb i.e. if I increased to make up for the raspberries? I think rhubarb all would be fine Beck, in fact I would have preferred the simplicity of one single fruit. Enjoy…..
What a fabulous cake Sandra. I have quote a bit of rhubarb at present – perfect for this glorious concoction. Must get some brown rice flour- a handy addition to these almond meal based cakes that call for a tiny bit of flour. How very exquisite, Sandra. Just lovely! What a fabulous recipe. Rhubarb is one of my all-time favourite vegetables (although I always think of it as a fruit!) and one of the best things about this time of year – when it’s at its best in NZ. 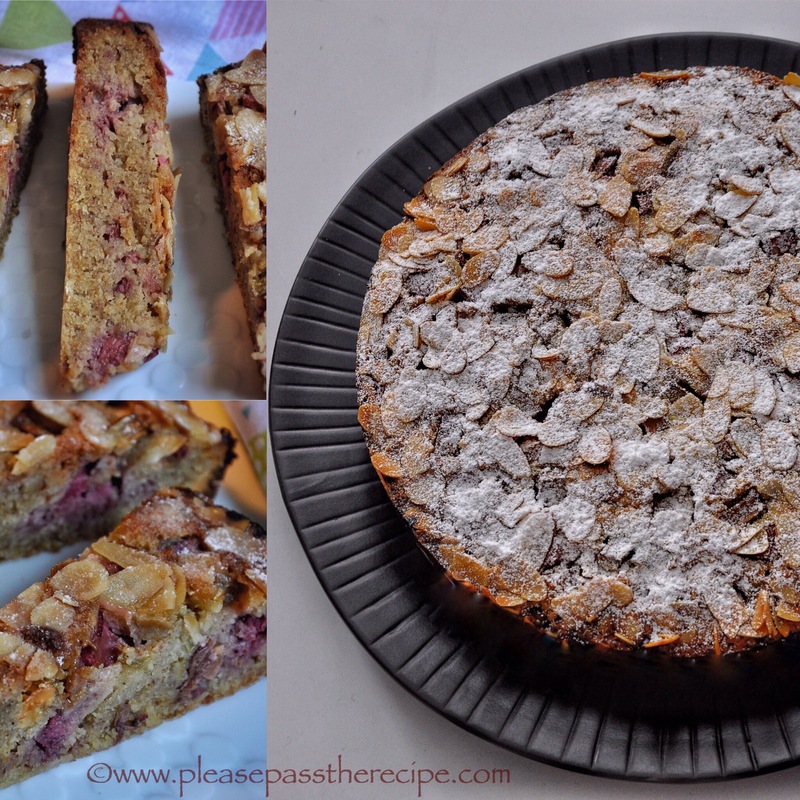 I’ll have to try this one – rhubarb and raspberry – yum! Looks great, Sandra, and I totally understand your white chocolate hesitation. I like that the raspberries and rhubarb get their own layer. I think this would also work with fresh strawberries instead of frozen raspberries, making it a seasonal cake here. Oh, rhubarb and raspberry in a cake, just lovely. Snap on the white chocolate feeling but in a blondie or cake paired with something tart, it really is a little workhorse hey? Like you, I am not a fan of white chocolate. However, I can see how the raspberry and rhubarb combination is a winner – particularly with that sugar dusted almond topping. Bookmarked for when I can get rhubarb again! This entry was posted on May 18, 2017 by ladyredspecs in Baking, Cakes, Cooking, Desserts, FODMAP diet, Food, Fruit Desserts, Gluten Free, recipes and tagged cake, cooking, FODMAP diet, gluten free, raspberries, recipe, rhubarb, white chocolate.